Smartphones have become essential in this digital era. Nowadays, it’s not only for making a phone call or sending a text, but It’s mostly connected with our soul. Mobile apps have made it possible for consumers to perform a wide variety of tasks. A recent report by comScore showed that mobile users had surpassed number of users on PC in 2014. Apple App Store currently has over 2 million apps while Google Play store has over 2.2 million. These figures are only set to increase. Mobile apps development is not only happening for smartphones today. They are now being developed for use on different devices including wearables, smart cars, connected homes and much more. SurveyMonkey estimates that the global revenue from mobile apps will grow to 962.5% by 2017. Other reports indicate that the increased usage levels of mobile apps on different devices will see the industry growth to be worth more than $100 billion by 2020. Progressive Web Apps are websites that are designed to feel and look like mobile apps. With the increased use of mobile devices to access information on the internet, these are bound to become more popular for both small and medium sized businesses. PWAs are also set to gain popularity as Google and other search engines introduce mobile driven search result algorithms that give priority to mobile friendly websites. Small and Medium Enterprise application development will lean towards PWAs for their affordability and the better user experience they provide. There has been more focus on providing location-based services including location-tracking and navigational tools. This trend is set to increase in 2017. Location based services are set to evolve even further to provide users with deals and information in real-time. These services can be implemented for offers in retail, indoor mapping, navigation, security and much more. The trend towards an increase in this area is evident as various tech giants have invested in location based services. If the popularity of Netflix, YouTube and Amazon Prime is anything to go by, consumers will tend towards streaming technology in the coming year. The shift in consumer behavior is largely because of the affordability and convenience of streaming content as opposed to subscribing to traditional cable TV. The demand for video streaming apps is set to grow as the demand for streaming services increases. The demand is predicted to peak in 2017. Augmented Reality (AR) apps were once thought to be gimmicky. However, with the increase in wearable devices and smartphones, AR tools will find hyper usage. Wearables have provided a landscape upon which AR tools can be applied more productively and effectively than previously thought. A good example is when someone sends a text with a keyword, an app related to the word or a specific action will be performed. Technology companies, such as Facebook, Google, IBM and Microsoft are investing in Artificial Intelligence and machine learning. The tech giants are setting groundwork for the move towards consumer services that operate without human intervention, which many believe will improve services to consumers. Artificial intelligence and machine learning will drive development of apps in 2017. Self-learning apps can help to improve customization and therefore enhance services to consumers based on their preferences or location. As technology continues to surge at breakneck speed, so do security threats. As more people use their smartphones for various tasks, they save and share sensitive and private data on their phones. The security of the smartphone is therefore set to become even more crucial as more apps become available to consumers. Despite sharing a lot of sensitive and private information on their smartphones, not many people take the security of their phones seriously. However, developers are becoming increasingly concerned about security. Developers are set to provide more security features that are in-built in their apps. These are set to make a big difference in the coming year and will be prioritized. Apps that provide interconnectivity are becoming increasingly popular. The fields in which they are applied are set to increase in 2017. Fields, such as education, health, smart homes, security and transportation are experimenting with the application of the IoT. Such integrations will involve an increase in the sharing of data and more complex platforms to enable devices to communicate. User experience is one of the major driving forces behind app design and development. As a result, app developers will place a great deal of focus on providing users with visually appeal apps. Some trends in design to look out for in 2017 will include splash screens, parallax graphics, split-screens, micro interactions and grid-based design. Companies will be seeking the services of graphic artists and animators to provide more user friendly and visually interesting apps. As more people use their phones to search for information and carry out tasks, developers are seeking to facilitate carrying out these tasks on mobile. There is set to be a surge in the integration of payment capabilities on apps. Shoppers will be able to complete transactions on apps and not have to visit the websites to do so. Developers are seeking to provide safe and secure ways to facilitate mobile payments. There are many more advances expected in the app industry in the coming year. 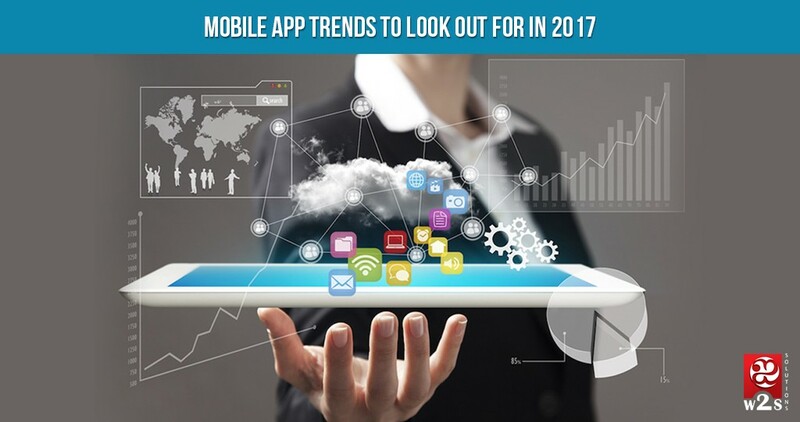 At a high level, these will be the driving force for App Development companies and trends in the coming year. Understanding an Industry needs and implementing a reliable solution will be the priority for success in 2017. Good one! Thank you for sharing the future aspect of mobile app development. it’s grate page to look out the mobile app development skill. Understanding an Industry needs and implementing the mobile application. Wow, what a wonderful read. I am really glad you shared this.